Valve was listening when Steam users asked for a way to share games. Valve announced their new game sharing feature, Steam Family Sharing, in a press release today. 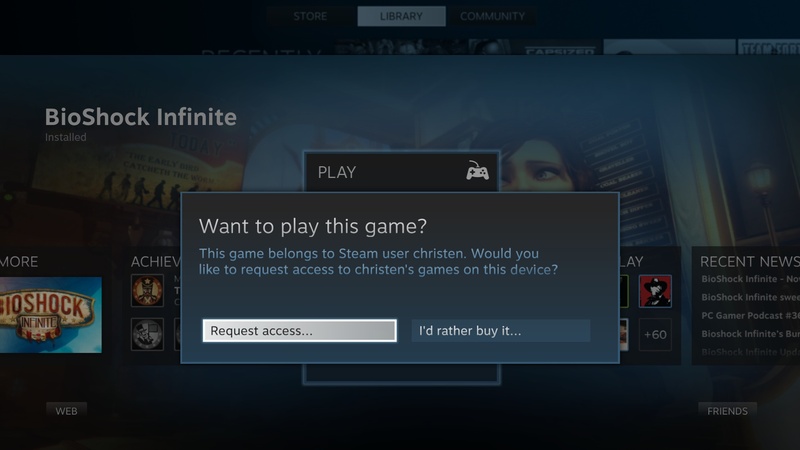 The feature allows people to share their game libraries by authorizing a shared computer and storing different users' saves to the Steam cloud. According to Valve's FAQ for the feature, a user designated as the lender can share his or her entire Steam library -- not a specific game. When the lender wants to play a game in his or her library, the borrower has a few minutes either to buy the game he or she is playing or to stop playing while the lender is logged into Steam. The Steam library can be shared with up to 10 devices. To enable Family Sharing, the user can either locally enable sharing in the account settings or remotely respond to a user's Steam request. The service "is designed for close friends and family members to play one another's Steam games while each earning their own Steam achievements and storing their own saves and application data to the Steam cloud," the press release states. However, not all games can be shared. Games with an additional third-party key cannot be shared between accounts, and regional restrictions will remain the same. Steam users interested in the feature can join the limited beta next week by joining the Family Sharing Group on the Steam community. The first 1,000 people interested will be granted access to the beta.